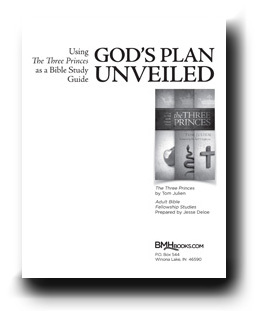 A new leader’s guide for individuals using The Three Princes by Tom Julien (BMH Boosk 2011) is now available as a free download on bmhbooks.com. God’s Plan Unveiled Leader’s Guide is intended to help in the study of the Bible from a different perspective using the book. Written by former BMH Books editor and Grace Brethren pastor, Jesse Deloe, the guide suggests additional resources for each chapter. Included with each lesson is a handout, which can be used to facilitate the students’ participation. Deloe, who served as the editor of The Three Princes, wrote the study guide based on his experience leading an Adult Bible Fellowship at the Winona Lake, Ind., Grace Brethren Church (Bruce Barlow, lead pastor).